The cottage has an incredible view of the Eagle Cap Mountains. It is close to the trailhead with its miles of hiking trails. The cabin has wood throughout and a gas log stove. 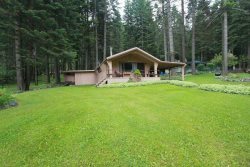 The vacation rental cabin is an easy walk to Wallowa Lake activities including go carts, horse backing riding, swimming, miles of hiking trails, miniature golf, and much more! The cabin has a wooden exterior and interior making it warm and cozy. This pet friendly cabin is the perfect getaway for a small family to enjoy everything the Eagle Cap wildnerness has to offer!